How do we invite Barry to our school? You may email Barry directly. E-mail is very efficient especially for initial inquiries. Will Barry travel to my area? Yes, Barry visits schools all over the US and in Europe. Travel is an additional cost but Barry drives to most locations, enabling him to “block” a series of school and library programs together. If Barry needs to fly, he can travel from any of three different airports, and is often able to get very inexpensive flights. What Schools and Libraries has Barry visited? Locate the schools and libraries throughout the United States where Barry has given concerts and author visits over the years. Fees vary depending upon details of the visit. Barry can come for a full day at your school or do a single assembly at three different schools in a one day visit–or two schools can share Barry for a half day each. What does Barry do in his visit? Barry can tailor his presentations to your specific needs and budget. In schools, Barry usually presents two or three assembly/meet-the-author sessions divided by grade level (the younger grades first, then the older grade levels). These assemblies are not your standard “author talks.” They are dynamic presentations that are more like performances. 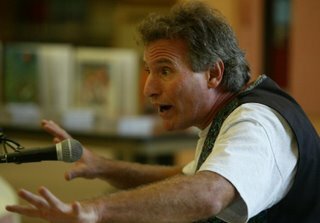 Barry brings his guitar and sings songs he has written, reads from his books, recites poetry and tells stories–all to demonstrate that there are many different ways to be an author. The sessions for the older students also deal with the “rough draft” process and are discussed in Barry’s web site under “Author workshops.” Barry can also do an afternoon kindergarten mini-sing for the kindergartners as one of his sessions. Because he brings his guitar and sings, as well as reading from and showing his books, the afternoon kindergartners are not left out of his author visit. Barry’s assemblies are often followed by a series of autographing sessions. Can Barry vary his standard day? Of course! Barry is willing to modify his day and do assemblies and a series of “meet-the-writer” workshops. What about a Family Night program? Barry is available for a discounted evening “Family Concert” where the students are invited back to school at night with their families. Nothing guarantees a large turnout more than having Barry at the school during the day. The kids will clamor to come back for more of his silly songs and stories. How far in advance should we plan the visit? Generally, three to six months is a good time period. Most of Barry’s bookings come in during the fall for the same school year but sometimes Barry has openings within one to two months, so don’t be afraid to ask. How can we ensure the success of our author visit? The best way is to prepare your students and staff. Barry will send your school a box of books for your students and teachers to read approximately one month before his visit. Barry will also provide a one page “teacher guide” that describes how each of his books relate to the school curriculum. Students who have read Barry’s books and heard his songs will be excited to meet and question him. Art activities also increase the interest of students and Barry’s art video can give you additional ideas. The more preparation teachers do with their classes, the more successful the visit will be. In his presentations, Barry talks about poetry and songwriting as other ways of writing, so Barry will also send copies of his CDs for all the students and teachers to listen to ahead of time. Yes, not only will Barry autograph any book or recording that is purchased, your school will earn 20% on every sale. This amount can either be used to pay for his visit–or your school may elect to pass this discount on to your students and staff. Your school can use the books that Barry sends as advance materials and Barry will provide a sample letter that can go home with the students a week before his visit. Barry will also be willing to autograph any book orders that come in after his visit. He will then autograph books at his home and return signed books to the school. There is no charge for author autographing. Barry will bill your school for his presentations and expenses following his visit. You will not be required to send a deposit or make payment on the day of his visit. You will usually get a bill about one week after the presentation. We can’t afford a full day. What are our options? Barry can do as little as one presentation at your school as long as there is another nearby school that can share a day with your school. Often Barry spends the morning at one school doing two assemblies back-to-back and then while everyone else goes to lunch, he travels to a second school and does two assemblies back-to-back there. If there are three schools involved, Barry can do one assembly at each school in a single day….or visit for two or three days. Are there any funding sources available? In addition to School PTA cultural arts funding and school grants from local businesses and art centers, there are many fun ways to fund a visit by Barry Louis Polisar in your school. You can sponsor a book autographing session with Barry’s books and tapes. Copy the sample sheet that Barry provides that describes his book offerings and distribute it to your students and teachers one week before his visit. Barry will autograph and personalize books for your students and teachers and the school will make 20% on all sales. Not only does this provide an opportunity for your students to own a personalized book, signed by the author they met, it is a great way for your school to earn $300-$1,000 and pay for additional workshops. By using the notice, Barry can autograph the books privately in an organized and non-commercial way. Barry can also autograph books at his home, following the program, since there is always a second wave of interest after his presentations. Autographed books are then sent to the school one week later via UPS. There is no charge for autographing books and tapes. Any other ideas for fund raising? You can also sponsor a penny drive! It’s basic, but what better way to show kids that every penny counts and that their efforts can result in bringing a very funny and entertaining author into their school. Organize a penny contest between classrooms. Place containers in each classroom (empty milk jugs work great!) and have the teachers use the daily counting of the pennies as part of the student’s math work. Have the students make a chart or graph to mark the progress of the drive. Send letters home so parents will be informed and supportive. Offer one of Barry’s books or tapes as an incentive to the classroom that collects the most pennies. Ask local businesses to contribute. Remember if each student and teacher can collect one hundred pennies each, you probably have Barry’s assembly programs funded already! You can also sponsor an evening concert: schools can sell tickets for an evening “Family Concert” and have ticket sales fund the performance and defray costs of a workshop series. Endowment funding: Ask Barry about special funding availability for low income schools or schools with special needs. Is there anything else we can do to have a successful visit? Advertise Barry’s visit widely to parents, students, the local public library and the community. Send reminders about book purchases and times of presentations the day before the actual visit. Barry sounds wonderful but is he really that good? Barry gets most of his bookings from visiting schools and libraries and having teachers and librarians recommend him to other schools. Please visit the reference and comment link.